Why Choose a Painting Holiday? The opportunity to paint with others who share your passion is possibly the nearest thing to a dream come true. Add to that inspirational destinations with tuition and guidance from leading artists and you are closer still to that dream. Make your Hobby your Holiday! 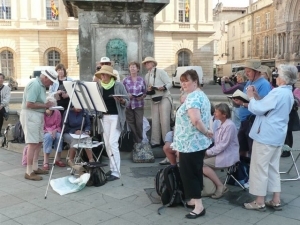 Niche travel company, Spencer Scott has been providing exclusive opportunities to travel with famous artists including Ken Howard OBE, RA, Lucy Willis, Hazel Soan, Pamela Kay and Peter Brown on inspiring painting holidays with like-mined people for over 25 years. "I've done lots of trips tour guiding for Spencer Scott Travel (Cuba, Peru, South Africa, Botswana, Uganda) and they have all been of the highest order, well planned, great itineraries, excellent support and clients always totally satisfied. They are a total pleasure to work for and I have loads of great memories to treasure as a result. Check them out if you want something special." "" Thank you for organising the extra flights and accommodation etc... The trip was a success for me. Eileen was the most thoughtful and hard working attendant/guide - she tended to our every needs - nothing was too much bother to her. Lachlan Goudie was such a gentleman. He was enthusiastic, kind and so very generous of advice and inspiration. He cheered us up and gave us hope when we were struggling with our work. 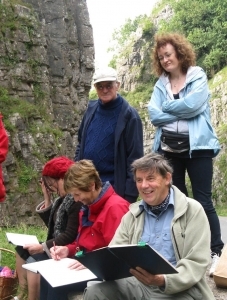 We all loved him and are in awe of his beautiful water colours and gouache paintings. Thank you for everything.""